Support the Imperial troops with the First Order Transport Speeder Battle Pack. Send enemy forces running for cover with the stud shooters and detach the shields and batons to arm the Stormtroopers. Then fire up the Flametrooper’s flamethrower and march into battle! Price is 6% below the initial Lego retail price, a € 0.91 discount! This comes down to 12.03 cent per brick. The First Order Transport Speeder Battle Pack (75166) Lego set is available from the sites below. However, they do not offer delivery to your selected region. 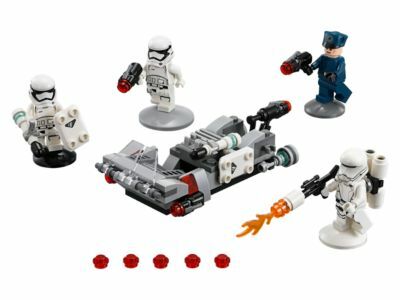 The First Order Transport Speeder Battle Pack (75166) Lego set is no longer directly available from the sites below. However, 3rd party partners of these sites might still have the set available. LEGO 75166 Star Wars: First Order Transport Speede..
Alternate description Send in reinforcements with the First Order Transport Speeder! Includes 4 minifigures: 2 First Order Stormtroopers, a First Order Flametrooper and a First Order Officer. Features space for 2 minifigures, front and rear stud shooters, and detachable stud blasters, batons and new-for-June-2017 Stormtrooper shield elements. Engage the enemy and fire the stud shooters! Detach the batons and shields and get the troopers ready for battle. Weapons include 2 batons, 3 stud blasters and a flamethrower. Measures over 1” (3cm) high, 4” (12cm) long and 2” (6cm) wide.